GivingTuesday is the “Opening day of the giving season,” and takes place after Black Friday and Cyber Monday, on November 27, 2018. It’s a special day when you can join millions of people across the globe and help create positive change by showing your support for causes that you care about. This year, we hope you will consider supporting the Canadian asthma community! 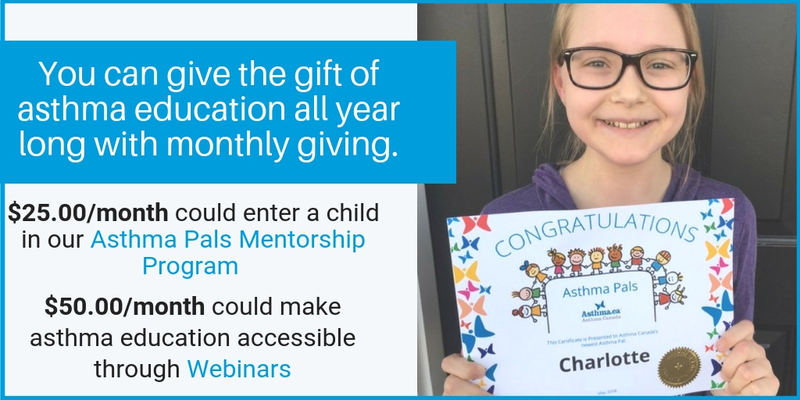 Asthma Canada’s mission is to help Canadians with asthma lead healthy lives through education, advocacy and research. 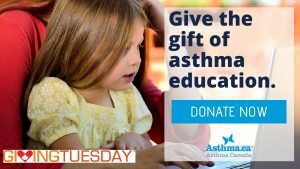 This #GivingTuesday, we are asking for your help to provide vital asthma education and support to those who need it most. Every week in Canada nearly five families lose a loved one to asthma, but it doesn’t have to be this way; roughly 80% of asthma-related deaths could be prevented with proper asthma education. By choosing to support Asthma Canada, you empower Canadians with asthma to take control of their disease and live healthy, active and symptom-free lives.